Cosmo Challenge: Run For That Bikini-Ready Bod! Celebrate Women's Month and get a smokin' figure in time for your many beach trips by joining the All Women's Run of Cosmo's sister mag Women's Health. 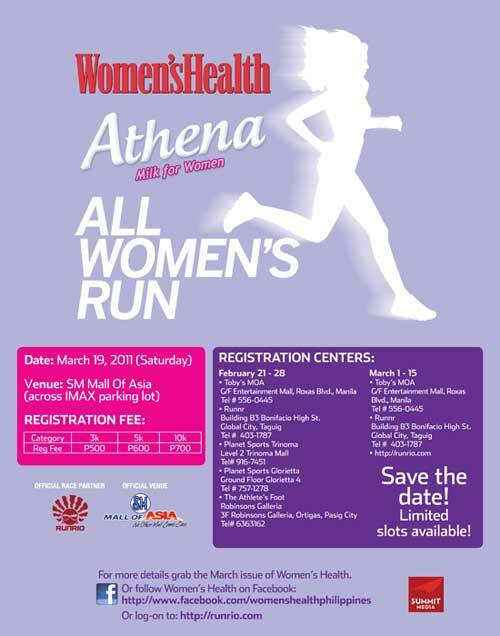 In celebration of Women’s Month this March, Women’s Health Philippines and Athena Milk for Women team up to stage their first-ever All Women’s Run, which will be held on March 19, Saturday, 5AM at SM Mall of Asia (across IMAX Parking Lot), Pasay City. While the run is open exclusively to women age 16 and above, girls below 16 may register, as long as they are accompanied by a registered female adult running in the same category. Participants may choose among the 3K, 5K, and 10K race categories. Registration for the Women’s Health and Athena Milk for Women All Women’s Run is ongoing until March 19, 2011. The registration fees for the respective categories are: P500 for 3K, P600 for 5K, and P700 for 10K. The race bag includes goodies from Women’s Health and Athena Milk for Women, and a specially-designed Women’s Health-Athena Milk For Women racer-back singlet that participants must wear as they cross the finish line to win and qualify for the finisher’s bracelets. The celebration of Women’s Month continues after the race! Visit the All Women’s Run Festival Area and take part in exciting activities from sponsors. For more registration details, grab a copy of the March issue of Women’s Health or become a fan of Women’s Health on Facebook.